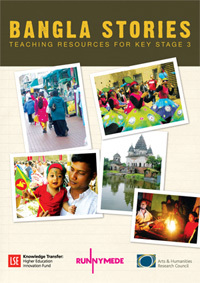 The Bangla Stories teaching resource pack has been designed for teachers, youth workers and any other professionals interested in young people growing up in Britain. The lesson plans are for KS3 students (11-14 years), though they can be used with older students. Although the resource pack is based on material from the Bangla Stories website, it is not aimed solely at young people of Bengali/Bangladeshi heritage. It is hoped that the themes, suggested research and projects will stimulate thought and discussion among students of all backgrounds. The lesson plans are primarily focused on KS3 English but they also provide a cross-curriculum experience linking Citizenship, History, Geography and PSHE. Because of the nature of the content of the lesson plans and the website, the resource pack provides many opportunities to consider extensive and stimulating cross-curriculum cohesion. Lesson plans devised by Anusree Biswas.